The Portland City Council began considering three ordinances at its meeting Thursday that could change the way the Portland Police Bureau operates. During a five-hour public hearing, members of the public largely criticized the ordinances as either not going far enough or removing the public from police oversight. Some also argued the city had made mistakes while negotiating the current police contract. 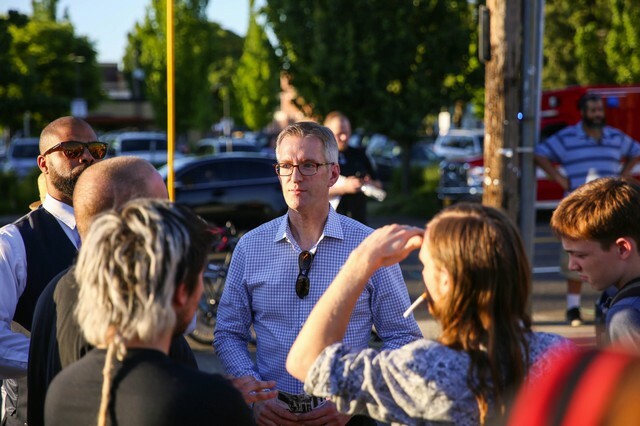 The proposed ordinance is Mayor Ted Wheeler’s response to a March memo from Multnomah County District Attorney Rod Underhill. 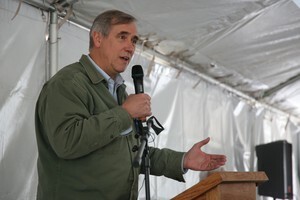 Citing an Oregon Supreme Court ruling from the 1980s, Underhill’s office argued that compelling an officer to make a statement to internal affairs — something police reform advocates have been pushing for — could jeopardize his criminal investigations. The DA’s memo came just months after the city negotiated away the controversial “48-hour rule” with the police union. That long-standing provision in police officer’s contracts allowed them two days before they had to speak with internal affairs about deadly force incidents. Critics said that rule gave officers too much time to craft a story that may not have been truthful. Under the DA’s interpretation of the law, officers would not be allowed to talk to internal affairs until a separate criminal investigation is complete, effectively delaying the administrative investigation by weeks or even months. If passed, the city would ask a judge to review the ordinance in light of the 1984 Oregon Supreme Court ruling and the District Attorney’s memo. Council members could vote on the change next week. 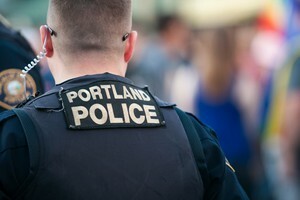 A second ordinance they’re considering would renew the public’s role in the city’s on-going settlement with the Department of Justice by establishing the Portland Commission on Community-Engaged Policing (PCCEP). The new body would replace the disbanded Community Oversight and Advisory Board (COAB) and would become part of the mayor’s office; the mayor also oversees the Portland Police Bureau. 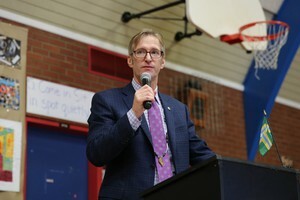 Portland Mayor Ted Wheeler in late May 2017. The public loudly criticized several new ordinances proposed for the Portland Police Bureau. would allow the city’s Independent Police Review to make recommendations after internal affairs investigations into alleged officer misconduct. Currently, the officer’s supervisor is the one who makes recommendations after an investigation. City staff and members of the public spoke about the suite of changes, both acknowledging past failings and expressing frustrations with the proposed changes. Nicole Grant, senior policy advisor for Wheeler, spoke about the newly proposed public engagement body, the PCCEP. Grant acknowledged that the city didn’t do enough in the way of training and support for the COAB. 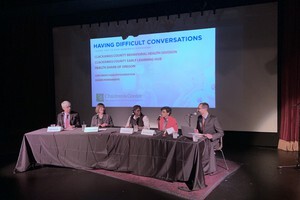 “So it’s understandable that this new plan for community engagement, which is intended to reach beyond the settlement agreement, has stigma attached to it,” she said. 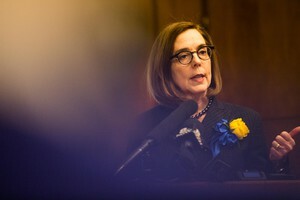 She said the proposed new oversight board was developed with the U.S. Department of Justice, and members of the Albina Ministerial Alliance (AMA) Coalition for Justice and Police Reform. “If we do not move forward with the plan, we will be faced with continued and unyielding strife between the bureau and the community it’s bound to serve — creating a lose-lose situation for our city,” Grant said. Several members of the public asked that the new board be expanded to include more members and that the members not be solely selected by the mayor’s office. Wheeler is proposing a board between five and nine members, but many who testified Thursday said they want between 11 and 15 board members. Others spoke about shortening the time for compelled officer statements to within 24 hours of a deadly force incident. “It is vital that officer testimony is collected as soon as possible following the use of deadly force by police,” said A.J. 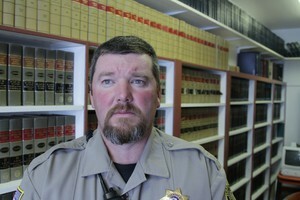 Mendoza, the racial justice trainer and organizer at the advocacy group Basic Rights Oregon. During his testimony, Albina Ministerial Alliance co-chair Dr. LeRoy Haynes Jr. brought up accusations about police behavior after the 2003 shooting of Kendra James, an African-American woman killed by Portland officers. T. Allen Bethel, who co-chairs the ministerial coalition, said he doesn’t approve of a PCCEP appointed and controlled by the mayor. “This removes the responsibility from the rest of the council members for any responsibility for its success and accountability,” he said. 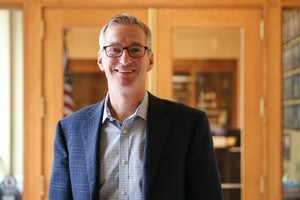 Later in the evening, Wheeler responded, noting that the new board would get public input quarterly and could do so more often if the group wanted. The head of the city’s Independent Police Review, Constantin Severe, urged City Council members to pass all three ordinances. Severe said the city failed to look at all these issues when it approved its new contract with police officers. 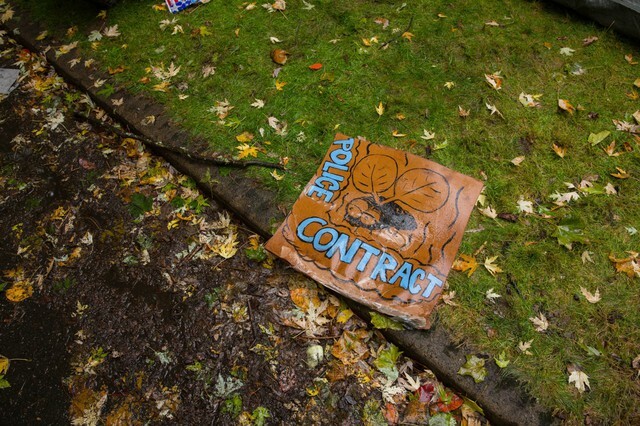 A sign on the ground outside of former Portland Mayor Charlie Hales’ house left after a 2016 protest on his lawn over the city’s latest police contract.